As much as I love old school games, I get tripped up by my nostalgia on a pretty regular basis. However, there’s just something endearing to me about simplicity, both in form and function. 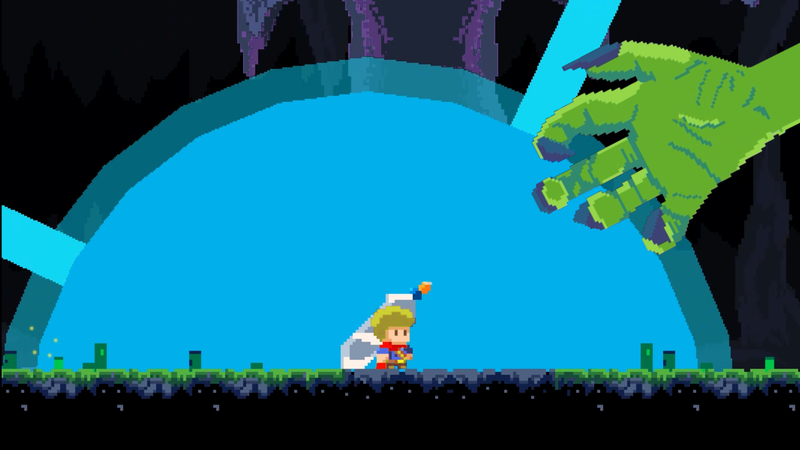 So I decided that I would give JackQuest: The Tale of the Sword a chance. 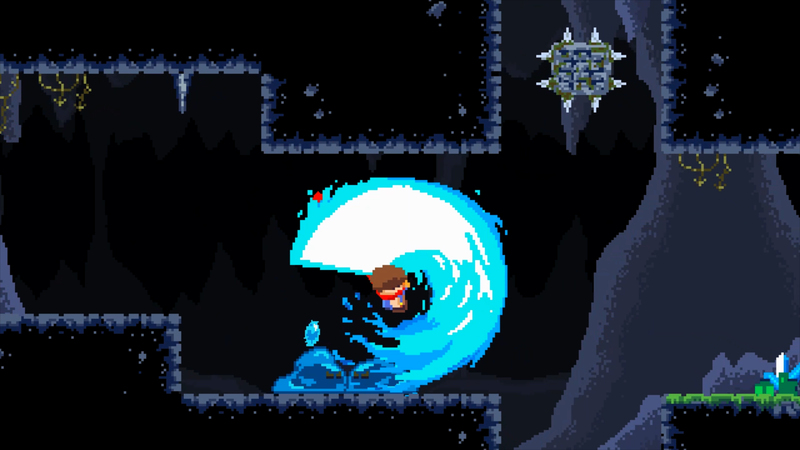 It had cute pixel art, seemed to have elements of a Metroidvania and a basic plot. I didn’t know the first thing about the developer behind the game. Turns out I should have done my research first, since JackQuest wasn’t quite as charming as it seemed. Before I go into all the details, I’m gonna do things a bit out of order and show the game trailer. Doesn’t look half bad, right? Sure, it’s simple, but not in a negative way. It even has a somewhat catchy soundtrack. Unfortunately, I quickly found out that JackQuest: The Tale of the Sword took a page from modern cinema. Namely, they managed to show off the best aspects in the trailer, while managing to completely gloss over the ugly bits. And unfortunately, there’s a ton of ugly bits in this game. But before I get ahead of myself, let’s talk about the premise of the game. It starts off like a knockoff Ghouls ‘n Ghosts, with Jack and the love of his life (who doesn’t actually seem that into him) talking in the forest. Then she starts singing, and all hell breaks loose. A giant green orc hand erupts from a portal and drags her along with it. Jack leaps after them, only to find himself in a cavernous dungeon. He’s determined to get his lady back, but it might prove challenging without a weapon. As luck would have it, he quickly finds a talking sword named Kuro, and he’s off to the races. There are small upgrades to your health and energy. That’s pretty much all there is for the poorly localized plot. Jack gets no development and doesn’t really evidence any significant personality, nor does his girlfriend or the Orc that stole her, named Korg. Nor does the game ever go into any sort of details about how Korg supposedly trapped the man who was Kuro in sword form. And frankly it doesn’t really matter, but it wouldn’t have hurt either. Sometimes games can skate by without any plot; many classics did so. But only if the gameplay is addictive and dynamic, and sadly that’s not the case here. The entirety of the game takes place in the opening cavernous dungeon. Your job is to keep pushing forward, unlocking new abilities and items to help you progress. I like that in theory, but everything is so paint by numbers it’s hard to get excited. 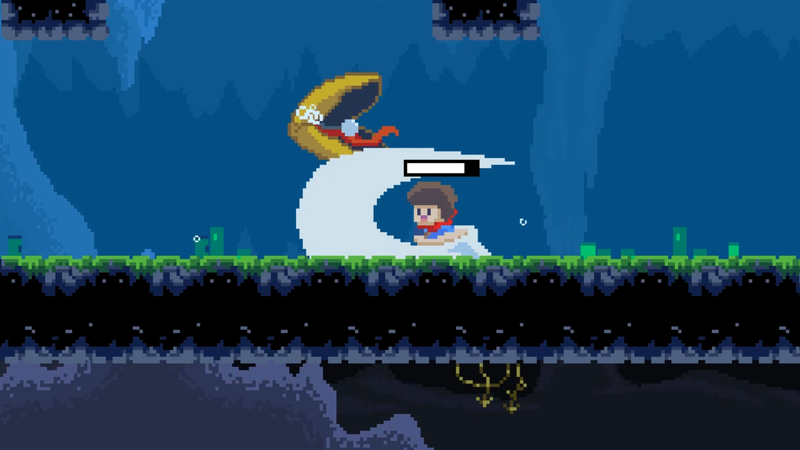 Sure, you get a double jump and find a bow for ranged attacks, as well as getting the ability to stay underwater indefinitely. But that’s pretty much it. You have a basic attack with Y, B is for jump, A does a super move and X changes between your sword and bow. On a side note, I did find it curious that in a game about a magical talking sword they felt the need to throw in a bow as well. There was a missed opportunity to have Kuro transform into different weapon forms, but that’s really asking too much. Because everything in this game is beyond basic. For example, while you are capable of super moves with both weapons, they cost you crystals. 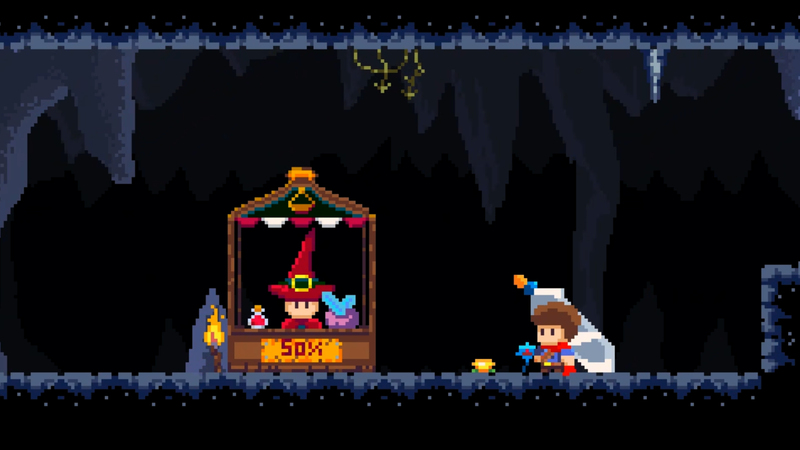 You can only find crystals while running around or buy them from the shopkeep, and it’s very easy to use them up before one of the game’s boss fights. With the sword super, you do a spinning, multi-hit attack and the bow super lets you do a ground dash. I really wish the game had signposted the latter, since it’s the only way to get past rows of spikes. Not knowing that, I painfully had to walk into them to get through a few areas. Besides that simplicity, there’s also the way the dungeon is gated. Oftentimes you’ll need to find keys to progress. While that’s fine in theory, I prefer for Metroidvania-styled games to gate things with abilities, not locks and keys. But the worst culprit has to be the map. You’ll eventually find a magical globe that shows the dungeon layout. I’m fine with maps, but this just happens to be the worst map I’ve seen in a game. Instead of a simple one like in Momodora, here it’s hemmed in and you have to move the whole thing around to see anything. I would have killed for the ability to see it all at once. As a result, I got lost a few times midway through the game, which is the only reason it took me almost 3 hours to beat it. Otherwise I venture most could easily beat the game in a little more than an hour. And while some short games are memorable, this one failed that metric. Who wants clams for dinner? 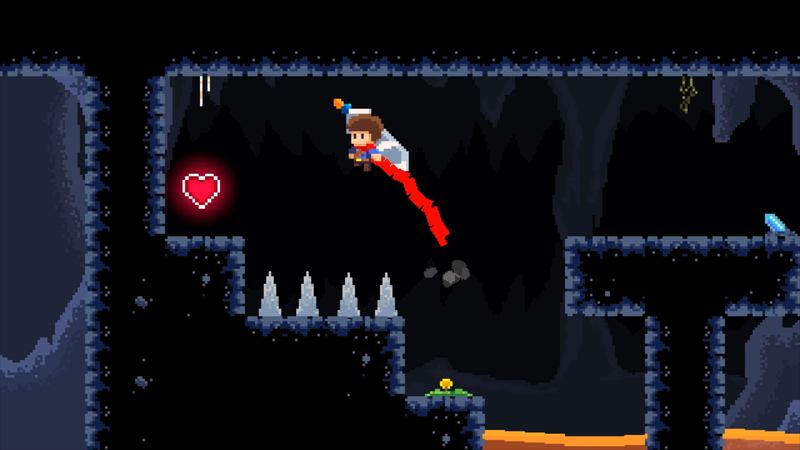 While I’ve focused a lot on the many negatives, there are some areas JackQuest does okay. While the combat is basic as can be, it’s also functional. I never encountered any bugs or glitches in my playtime.The five boss fights were also somewhat challenging and even fun on occasion. The giant spider and the grim reaper were highlights. 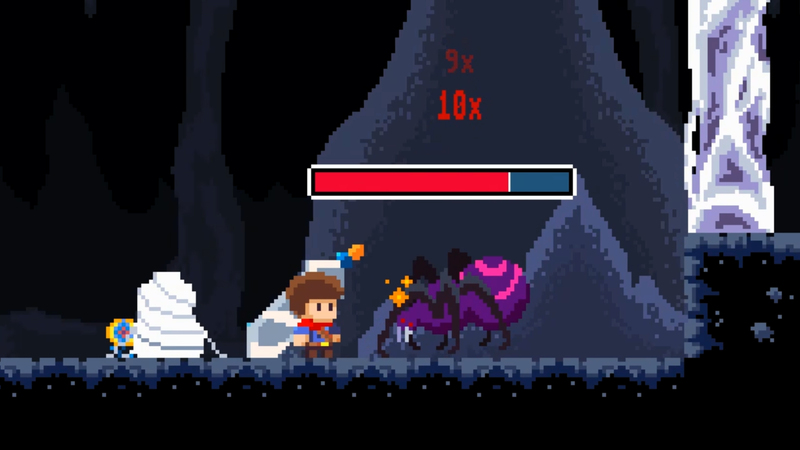 Though I was frustrated by quirks of those boss fights, such as being killed by a mini spider spawned right after I killed the spider boss and how the grim reaper boss can summon hordes of nearly unkillable skeletons. I wouldn’t mind if the latter just took time to mow down, but seemingly they could only be permanently killed by your super moves, which I established earlier are in limited supply. Another area the game does okay is with the prevalence of save points. There’s plenty of them, and they automatically save your progress once you run past them. Also, while the graphics are obviously simple, they also have a certain charm to them. I liked how Jack’s scarf flowed behind him as he ran, and the overly dramatic way he wielded his giant sword (enough to make Cloud envious). The music also isn’t bad, it’s just nothing that stuck with me. Believe it or not, I still haven’t covered the areas where the game had the worst problems. Though I discussed the lack of plot and character development, there is one area that’s worse: Kuro’s running commentary. As you run about your sword will question you about your love interest, or randomly yell “Kill, kill, kill!” At first it was kind of novel, but it quickly grew irritating. But as bad as that was, the shopkeeper was worse. Never have I seen such a counterintuitive system. All three of his different items for sale cost a ton of gold, and to select them you literally have to jump into them. It’s like the developer looked at the system found in old Zelda games and tried, and failed, to do them in a 2D environment. All I needed was a simple drop down menu to pick from, but even there JackQuest denied me. But perhaps my biggest issue was how rough the controls were. Sure, they work and aren’t technically broken, but they’re a far cry from polished. Jack has all the control of a rocket-powered balloon, and utterly lacks precise movement. This wasn’t that bad when fighting, but it made exploring the dungeon very difficult. I really wish JackQuest: The Tale of the Sword could have lived up to my initial expectations, but sadly it just kept finding ways to frustrate me. While it’s not technically unplayable or broken, it’s also derivative and unsatisfying. It’d be one thing if this was an early concept or even a free demo, but asking $9.99 for a game this basic is ludicrous. My only hope is that the developer will learn from his mistakes with this game and future projects can benefit from a lot more polish. It’s fine for a game to be simple, but that’s not an excuse for a rushed mess. Unless you really love basic games, I can’t recommend JackQuest, unless it’s dramatically on sale. As it is now, this Tale is more of a cautionary one.